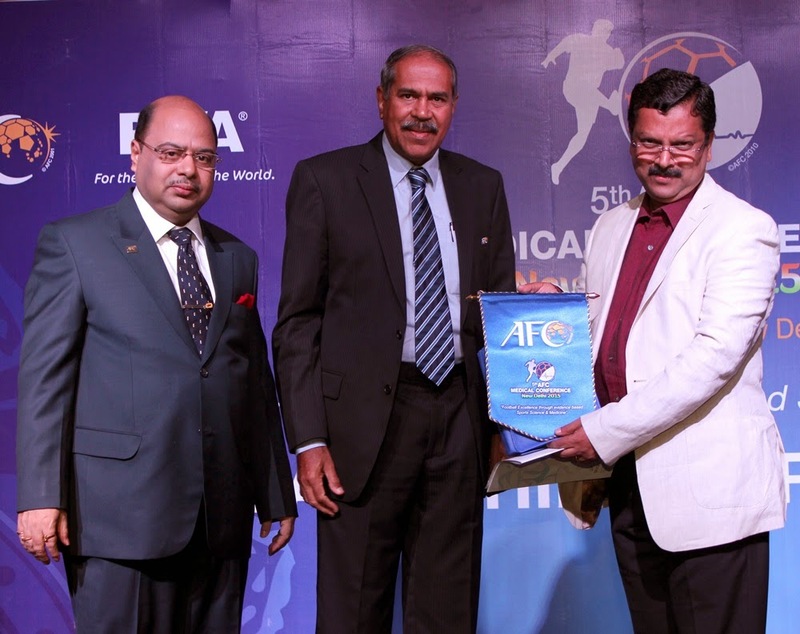 The Launching Ceremony of the 5th AFC Football Medical Conference took place in New Delhi on Saturday (April 26). All India Football Federation Senior Vice-President Mr. Subrata Dutta and Dato Gurcharan Singh, Chairman, AFC Medical Committee, lit the lamp to set the ball rolling. Besides, Dr. Shaji Prabhakaran, FIFA Regional Development Officer for South and Central Asia; Mr. Jiji Thomson, Director General, Sports Authority of India (SAI); Dr. PSM Chandran, Organising Secretary, AFC Medical Conference, 2015; and a host of other dignitaries were also present on the occasion. 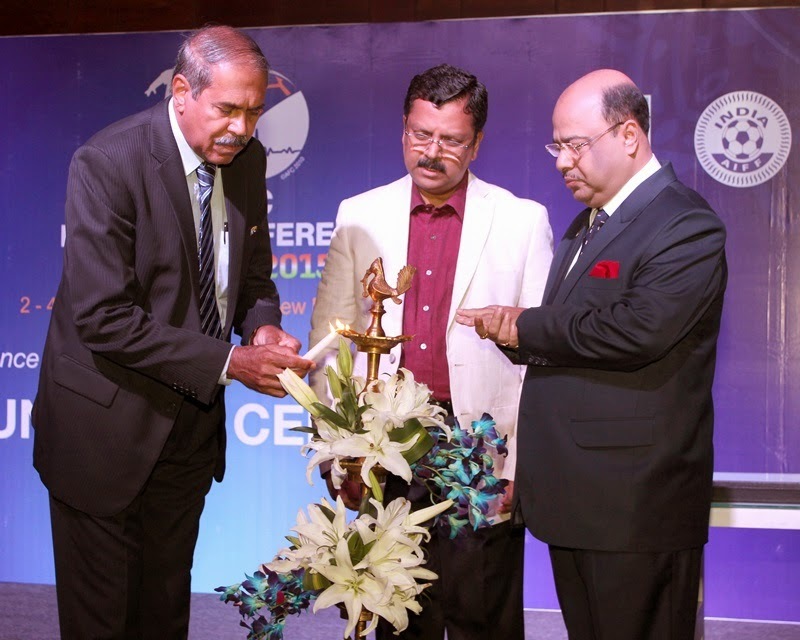 The Launching Ceremony took place almost a year before the Conference, the first-of-its-kind in India which would be held from April 2 to April 4, 2015 in the Capital. The Conference would be attended by around 800-1,000 delegates from across the World. India would be the fourth Country to host the prestigious event with Malaysia (2000 & 2011), Japan (1995) and Oman (2005) having earlier hosted it. Dutta mentioned it’s an “honour for India to host the biggest Sports Medicine Conference of Asia.” “It is indeed vibrant times for Indian Football. With the U-17 FIFA World Cup set to take place in three years time, the first-of-its kind AFC Medical Conference in India could not have come at a better time.” “Success comes when right action is taken at the right time,” he further stated. FIFA Development Officer Dr. Prabhakaran also advocated medical assistance for all Airtel I-League Clubs, State Associations, and all stakeholders. “FIFA always supports the use of modern medical technology,” he informed. “The AFC has plans to take the 5th Medical Conference to a greater level. It is not only about the name change which has been kept in tune with FIFA but subjects like Team physiotherapist Workshop, sports physiotherapists workshop, anti-doping workshop would also be conducted with the help of New Delhi Anti Doping Laboratory.” Dutta also stressed on the importance of Indian Clubs and their administrators understanding the importance of Medical Science in the modern day game. Waxing lyrical on just-crowned Airtel I-League Champions Bengaluru FC and their squad being the fittest, Dutta said: “Bengaluru FC’s win in the I-League was victory for professionalism over traditionalism.